SMARTT Corporate Profile – SMARTT: Scale Models, Arts, & Technologies, inc. Founded by Michael Hart in 1995, Scale Models, Arts, & Technologies, Inc. (SMARTT ) is a Florida corporation begun as a culmination of Mr. Hart's desire to offer only the highest quality in the production of all manner of three dimensional miniatures to a diverse group of industries. 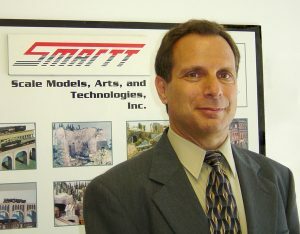 While SMARTT enjoyed early success in offering these services, Mr. Hart quickly recognized the unique opportunity to fill the strong demand for the successful production of high end Custom Model Railroad Layouts. Founder Michael Hart's overriding insistence on unrelenting customer service is paramount. Being in a 'dream' business, Mr. Hart is an excellent listener and communicator. With these attributes, combined with his creative know-how and the expertise and talent of his entire staff, the SMARTT team has time and again captured the imagination of its clients, piecing together abstract ideas into a clear vision. This is one of the essential ingredients contributing to SMARTT 's success. The result. The design and fabrication of top quality custom layouts for both corporate clients, and private enthusiasts, has become the mainstay of company operations to the point where SMARTT is the nation's leader in this field. Scale Models, Arts, and Technologies . . . our name says it all . . . The "Technologies" side of the company is extensive, with expertise in computer aided design, planning and analysis, mechanical and electrical engineering, and precision fabrication. The "Arts" side of the company is unmatched. The craftsmen, model-makers, and artists at SMARTT combine their talents to breathe life into every model! Unique amongst our peers, at SMARTT , we understand the relationship of time and money. Promises made are met, while unrealistic demands are refused. Our record of achievement speaks for itself! . . . Just ask any of our customers . . . Frequently characterized as museum quality, three dimensional art, an accolade most often received from our clients is . . .
"Wow! This is way more than I expected!"